Meg and her young brother charles, together with a new friend, Calvin, embark on an adventure to save their father who had been experimenting with time travel. As they encounter the most evil forces traveling through space and the most benevolent allies, Meg, Charles, and Calvin must rely on their unique talents and gifts and ties to one another to save Mr. Wallace and find a way back to Earth in time to save it from the darkness. L’Engle, M. (1962). A wrinkle in time. New York, NY: Random House. It’s difficult to add to the immense amount of reflections and critiques of this work. Often hailed as the original science fiction for children, L’Engle’s famous novel has been dissected, discussed, and passed from reader to reader with enthusiasm and joy for years and will be for years to come. 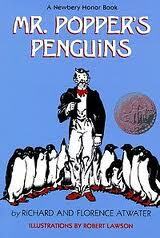 As I was reading it, I felt sad that I did not experience it the first time as a child or even young adult. As an adult, I found myself relating to the adults and guides in the novel, hoping for the children’s safety and speedy return, rather than empathizing with the children themselves. I can best describe the novel’s profound impact on the reader by sharing that as I was reading it, I forgot that it was science fiction. The time travel, technology, creatures, and outer realms became so believable through the eyes of the children that I was able to achieve suspension of disbelief; this comes difficult for me as sci-fi is not one of my preferred genres. 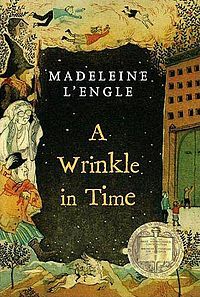 The decade of the 1960s saw publication of A Wrinkle in Time (Farrar, Straus & Giroux, 1962), first of the Time Quintet. Written by Madeleine L’Engle, this book introduces Meg Murray, whose scientist father has disappeared, and three unusual characters that “tesseract” Meg, her brother, and a friend around space to locate her dad. VOYA Board Member Paula Brehm-Heeger states this work was groundbreaking in its “use of science fiction, with a dash of fantasy,” and a female heroine. Complete with other worlds and unusual creatures, it illustrates the fantasy worlds crumbling due to unproductive traditions, juxtaposed against Meg’s own family struggles. The book is still read today, often referenced in literary and pop culture, and is number twenty-three on ALA’s 100 Most Frequently Challenged Books of 2000-2009 (http://www.ala.org/ala/issuesadvocacy/banned/frequentlychallenged/ challengedbydecade/2000_2009/index.cfm). HOLLEY, P. (2011). Groundbreakers [Review of the book A wrinkle in time]. Voice Of Youth Advocates, 34(2), 116-119. In addition to a special collection of Newbery and other award winners, A Wrinkle in Time, can be integrated into genre talks and presentations about science fiction. It’s important to teach readers about genre so that they can better select texts that might interest them. Science fiction is an often misunderstood genre; many patrons still think of it as space opera (e.g., Star Wars). The librarian could use excerpts, trailers, or even film clips to introduce young readers into the basic tenets of science fiction/ fantasy and follow it with a book pass of titles that represent the diversity the genre has to offer. Book trailer for a recent graphic novel adaptation of the original classic. This entry was posted in book review, Newbery, SLIS 5420, YA. A toddler unknowingly escapes the murdered who has just killed his entire family by waddling into a graveyard whose ghosts become enamored with the young boy. With a frantic and final plea from the young child’s recently murdered mother, the residents of the graveyard vow to protect him and make him part of their community, shielding him from the Jack who seeks to finish the work that he began. The toddler, Bod, grows into a curious and adventurous young man who is constantly seeking connection with the outside world, sometimes through very dangerous encounters with the spiritual and physical world. Gaiman, N. (2008). The graveyard book. Harper Collins: New York. Without risking any major spoilers, I have to confess that I was nearly unable to move past the first ten pages. As soon as my mind attached itself to the eighteen-month old boy bumping his rump down a flight of stairs, diaper sagging, my heart stopped. Any mother of a young child, especially a boy, will immediately feel a maternal affection for Bod and his tragic dillema at the onset of the story. Anyone of us in Mistress Owens’ shoes would have done the same. From the first line “There was a hand in the darkness, and it held a knife” I was hooked, and despite my initial gut-wrenching reaction to the murder of Bod’s family and his mother’s final plea, I knew I had to find out what happens to that little naked baby. 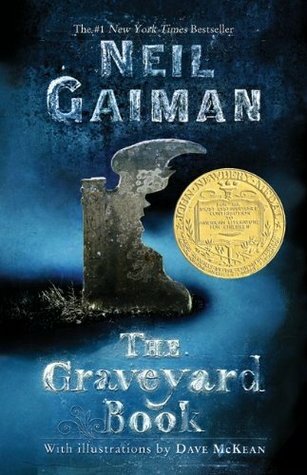 Gaiman crafted this novel to be character-driven, particularly through Bod, but also through the villainous Jack, enigmatic Silas, and host of ghosts and ghouls who reside in the grave yard. The relationships that Bod form with each of them drive the plot and conflicts, leading to an ultimate mash-up of life and death fighting to save one young man. In one particularly poignant scene, the dead leave their home to attend a festival during which they dance with the living only to be forgotten once more by morning. Scenes such as this serve as a reminder of the ways in which we remember and keep loved ones who are no longer with us, near us. “While his parents and sister are murdered by a mysterious character named Jack, a toddler gets out of his crib, walks out the open front door, and makes his way uphill to a nearby graveyard. “Protect my son!” his mother’s ghost exhorts the spirits of the graveyard. A character named Silas and the Owenses, a childless ghost couple, want to raise the boy. The graveyard residents convene and, despite some objections, vote to keep the boy. It won’t be easy, though, says Silas. “It is going to take more than a couple of good-hearted souls to raise this child. It will take a graveyard. Schneider, D. (2010). It Takes a Graveyard to Raise a Child [Review of the book The Graveyard Book]. Book Links, 19(3), 6-8. The Graveyard Book would be an excellent Newbery Award winner to introduce to students as they explore awards for children’s literature. It could stand as the centerpiece to a display or as a gateway for children who are comfortable with illustrated and graphic novels to try a chapter book. Additional award winner’s such as Brian Selznick’s The Invention of Hugo Cabret could be the content of a book talk featuring illustrated novels that have received recognition in the world of children’s literature.